My birthday is on the 7th October and I have 5 brothers and 2 sisters. My favourite game is playing with dolls. In Jaiama Bongor life is hard for children like me. But sponsor me today and you can change my world for good. Mariama lives in Jaiama Bongor, Sierra Leone. By sponsoring her, you can help her whole community, to make it a better place for children. 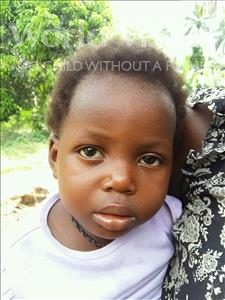 For children like Mariama, growing up in Jaiama Bongor, malnutrition is a fact of life. Families don’t have enough money to provide children with the essentials. Many children don’t go to school. Those who go to school struggle to succeed because of overcrowded classrooms and poorly-trained teachers. Your sponsorship can change Mariama's world, and her community, for good.